On Monday, August 21, 2017, a total solar eclipse will be visible within a band across the entire contiguous United States; If you are not within that band in the USA, you will still be able to see a large portion of the Sun covered by the Moon. Now let us get to the main topic: How to take photos of the Solar eclipse. Sun photo in Auto mode. To be ready for the Solar Eclipse photos this Monday, I wanted to run a quick test. I have few SLRs but I took out the fixed lens Panasonic FZ200 which offers easy convenient 24x zoom. Also, when there is abundant light, or too much light in this situation, any camera would work almost equally. The Bokeh of SLR is not possible as you can't take photos with wide open aperture. Also, SLRs are good for low light but here we are in a situation which has too much light. I needed to reduce the light getting into the camera. I changed the camera mode to Manual from Auto. To minimize light, I set up the fastest shutter speed of 1/4000, smallest aperture of f/8 and lowest ISO of 100 on my Panasonic FZ200. This is the best this camera would go to take the least possible light. I zoomed to 24x- around 600mm equivalent on a full frame camera. I took another photo. Same result. I couldn't take a photo of the Sun. It was all white! Now to be able to take photos of the Sun before and during the Solar Eclipse, I had to do something. I needed to find a way to reduce the light getting on to the sensor. On a summer day, to reduce light getting into our eyes, what do we do? We put on sun-shade or goggles. This is was I needed to do for my camera. I have few natural density filters but my son, Miraj, took them with him on his trip to Sweden and Iceland to photograph water falls. 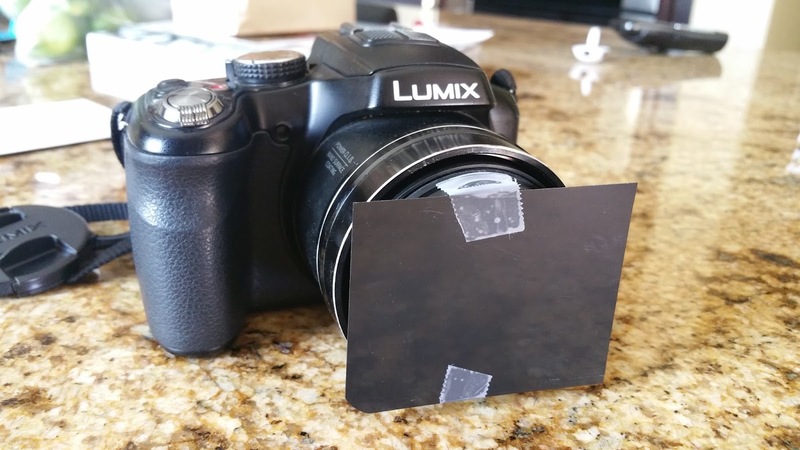 Also, I am not sure if 2x, 4x, 8x ND filters would be able to block enough light. I thought of putting sun goggles in front of the lens but it is not convenient to hold both the camera and the goggles same time. Suddenly an idea stuck into my head. I searched for some old X Ray in the house. Luckily (LOL) having two sports loving boys in the household, it wasn't a difficult job. I cut a piece and put it in front of my camera. Look at the photo of my camera below! I went out in the backyard, pointed at the bright noon Sun, zoomed the lens all the way to 24x and voila, I had limited most of the light and I was able to capture the photo of the Sun. 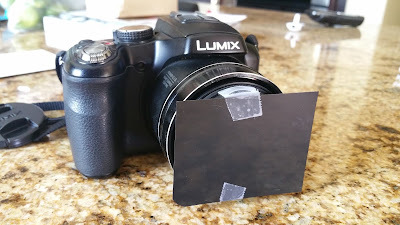 I am excited with this camera jugaad and I am sure I would have fun taking photos of the eclipse on this Monday. I am all set! Here is the photo of the Sun I just took with the X Ray film in front of the lens! Sun photo at noon in broad day light! As I say on this blog, in most of the situations, you can take better photos with some easy to follow tips. Possibility of Trial and Error photography is the biggest blessing of digital cameras. Take a trial photo. Find the issue. Try to fix it. Here, the issue was too much light. The solution was to try to reduce the light!